JMed is planned to be multilingual. Any translation will be realized upon customer request. JMed is developed and distributed by Social IT. JMed is a modular software system that supports, improves and streamlines the administration and the control of health centers. The idea behind JMed stems from the desire and the need of creating a software that goes beyond the traditional business applications (medical records, agenda, financial control). The information is organized and focused on the patient, following a user- centric paradigm, all available within a click . The project starts from the study of organizational methodologies applied in the most advanced studies. The basic idea of JMed is “merge into a powerful organizational system the best operating procedures“. The goal is to design and create a software that makes things easier, without creating any complications . JMed facilitates the work of the people involved in the daily work of the health center through a clear and simplified management procedure. At the same time, JMed provides operational flexibility in order to allow a strict control of exceptions. JMed appearance and use are similar to those of the most popular programs ( Word or Excel … ) so as to make its adoption immediate. JMed is characterized by a high technological content. The guidelines adopted for the design and development of JMED have led to the adoption of the more consolidated technologies so to make our software simple, fast and reliable. Access to the database through ADO.NET ensures compatibility, reliability and scalability. Windows .NET standard GUI guarantees functionality and performance. The full compliance with the TCP / IP standards and the applicability of the model ‘ Terminal Server ‘ complete the JMED technological equipment . JMed is compliant with all standards related to information safety and security. The program has also been designed to guarantee a comprehensive security of personal information of patients. The therapist or any operator responsible for the service can transfer the patient’s medical records to any type of digital record, in order to ensure safety even when the information is transferred from the central database. JMed uses the MS SQL database and this choice further enhances the level of security and reliability. The JMed guiding system assists the operator throughout the process, ensuring high operational performance and consequent straitforward advantages. The therapist or the administrator can customize the guided tours and the control phases. Moreover, the several steps for the treatment proposal (therapy) for the diagnosed pathology can be automated. JMed monitors in real time all the economic aspects related to the invoice items providing to the health center an important tool for the optimization of cash flows and the management of substandard situations. Well begun is half done. JMed version Start has been created for young professionals and for new clinics. The Start version provides all the basic services: patient’s record, quotations, invoicing, data and service history, agenda. JMed Start allows you to immediately set up an efficient organizational system, with significant benefits for your professional activity. The best tools to emerge. The PRO version of JMed is equipped with a series of tools properly designed for the specific needs of consolidated health centers, where many operators work and collaborate and the professional is supported by a large structure. The JMed PRO version handles more professionals, allows for the control of different specialists taking care of the same patient, even within the same course of treatment. Power and control of the organization. The version NET of JMed is designed for large centers, associated professionals and dental clinics. The NET version is able to operate in a client/server setting supporting the Microsoft SQL Server Database, the Terminal Server services and all the most advances network. 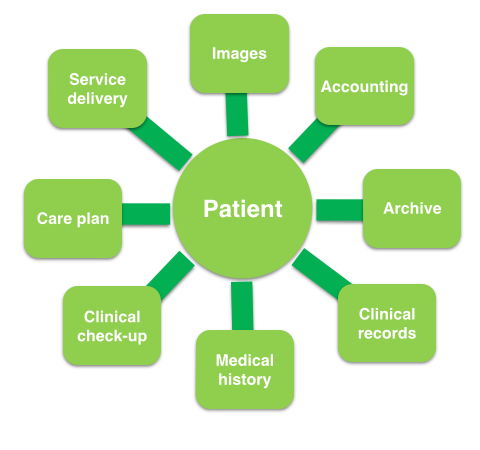 What about always bringing with you, to courses or conferences, the patients’ records? Would like to have all patient’s data recorded on your notebook and study them when out of the office? Would you like to share data with a colleague for a consulting advice? Would you like to create a separate archive for cases of particular importance? The team JMed invented the shared records. With just one click you can copy the patient records on any magnetic support and review them, control them anytime and anywhere you want. Images and digital X-rays are available in the patient’s record so as to allow for an immediate consultation and archiving. You can acquire images directly from an X-ray scanner and digital camera. You can also improve image quality thanks to embedded powerful photo editing functions (e.g., zoom, crop, resize, etc..). Each image can be associated with different types of information: date, phase of care, diagnostic notes, etc . JMed can be easily connected to any professional accounting software. This possibility allows for squaring the circle in terms of organization and administration. The data transfer occurs through a specifically designed interface, built with a system that makes it completely automatic. JMed can be also interfaced with various programs used by professional accountants and in this case the system also provides electronic submission of the data related to the financial records.